The requirements for chilled cargo from a regulatory standpoint depends on the variety of cargo. As a rule of thumb the temperature should be kept in accordance with the temperature stated on the product packaging. Special regulations may apply for some EU countries. Please consult our commodity database for Maersk Line guidelines to various commodities. Be able to support a stacking height of up to 2.4 metres (7'10"). Withstand humidity without collapsing (wax-impregnated cardboard and/or plastic crates is recommended for high humidity shipments). Allow the passage of an adequate vertical airflow through the cartons. Each carton should have symmetrical holes at both the top and bottom. This allows optimal air circulation since the air comes from the bottom of the container. The number, placement, size and shape of the air holes are determined by the product being packaged. The wrapping material used must be secured in order to avoid any blockage of the evaporator fan. Heat, water vapour, carbon dioxide and other gases produced by the respiration process from chilled live products may damage the product and should therefore be removed. The stuffing should allow the refrigerated air to circulate through the packaging material and throughout the entire load. For optimal stowage we recommend a pallet size of 100x120 cm (40"x48"). The cartons must be stacked squarely on top of each other to ensure even distribution of the weight to the four corners of the cartons. The corners of each carton should be supported directly by the pallet. 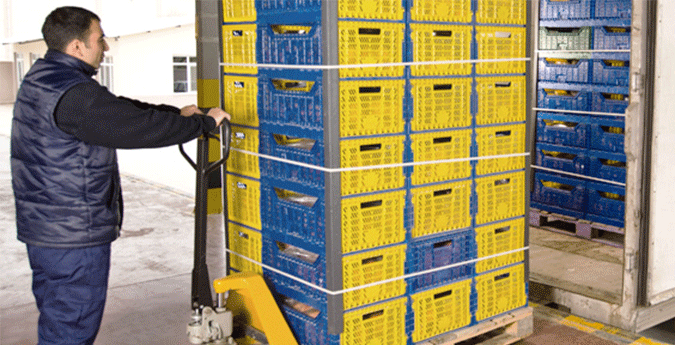 Place cartons on the pallets so that air flows up into the cartons unrestricted. The ventilation holes, located at the top and bottom of the cartons, must be aligned in order to allow free passage of air through the entire load. Shrink-wrapped pallets, slip sheets, foam trays, plastic bags or similar materials that obstruct and block the air passage should not be used. If wrapping pallets with plastic to provide stability, do not cover the bottom or the top of the cartons.